While not all of us are fully aware of what Cloud Computing is, much of this technology is nothing new to us. There are several cloud-based applications we have been using without knowing they are on the cloud. Cloud computing has been tested to have the potential to transform virtually all the industries. This is why countless businesses around the world have already moved to the cloud, and the rest are all set for a switch. However, while we think of cloud computing as a completely new concept, most of us have been using many cloud-based applications for a while now. Only that we didn’t know they are on the cloud. 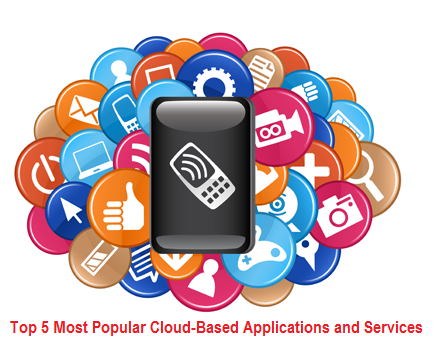 Below are Top Five Most Popular Cloud-Based Applications and Services, we’re all using or have used at one time or another. One of the most commonly used cloud-based applications today is Google Drive. Why we hardly think of it as a cloud-based application is because it’s not unique. There are several similar storage solutions on the web, including Box and Dropbox. And then it hardly matters how we recognize Google Drive as long as we are getting 5GB of storage space for absolutely free. Skype is another highly popular and useful connectivity platform to emerge through the cloud. In fact, the current form of Skype is coming with several handy features such as missed call notifications and synchronized chat. All these improvements are a result of the company’s focus on having its private cloud servers. And now that Skype has its own servers, it is powering all the services through them. Facebook is the without doubt the most used and popular social networking platform today. Interestingly, however, most of don’t know it is a cloud-based application. Regardless, SMEs are busy using it to reach potential customers in order to enhance client engagement and boost brand loyalty. If you want, you too can create Facebook pages for your company, place ads, and discard the tradition of sticking to usual marketing techniques. Yes, your favorite social network that is extremely popular globally for 140-character updates is on the cloud too! While Twitter’s initial fame can logically be attributed to first-hand news stories, there is much more as to why enterprises of all types and sizes worldwide rely on it when it comes to engaging directly to their potential audiences. It is only on Twitter that you get to do market research and review your customer service. When the talk turns to the biggest cloud-based applications downloaded by enterprises virtually everywhere in the world, LinkedIn tops the list. This is one of a few places where you get to connect with like-minded people and promote your business in the best possible manner. Another big Cloud-Based Applications and Services, LinkedIn is capable of securing the identity and rights of its users. After all, not all social networks have over 65 million entrepreneurs and professionals associated with them.